The amazing thing is that every season, especially after the opening week of football, there are a couple of explosive players not on the majority of rosters, putting up obscene fantasy numbers. This year was no exception. A certain tight end in Denver kicked it off last Thursday night, and then a slick old veteran wideout kept it going on Sunday. Of course we’re talking about Julius Thomas and Anquan Boldin, neither of which we’re listing below because by now they have all been gobbled up in most leagues. 1. 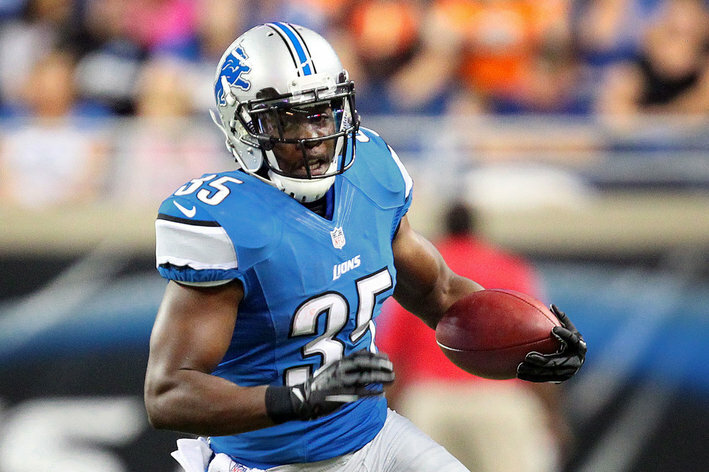 Joique Bell-RB-Lions- We like Bell for several reasons. First he has already beaten out 2nd round draft pick Mikel Leshoure for the RB2 slot behind Reggie Bush. Second is his versatility. Last Sunday he had 6 rushes and 5 receptions for 92 total all-purpose yards and two touchdowns, making for a very productive afternoon. And lastly, should anything happen to Bush, Bell would take over the RB1 duties so he even becomes a handcuff for Bush owners. At the time this went to publication, Bell was owned in a modest 37% of leagues. 2. Marlon Brown-WR-Ravens- With WR Jacoby Jones spraining his medial collateral ligament in Thursday night’s game and now looking at a 4-6 week recovery period, Brown has been handed a golden opportunity. Following an outstanding pre-season where in limited action Brown garnered 161 receiving yards, he didn’t miss a step last week with his 4 receptions on 6 targets good for 65 yards and a touchdown. He’ll face a Cleveland Brown secondary that’s mediocre at best on Sunday and is widely available (going into Tuesday night) owned in only 5% of leagues. 3. 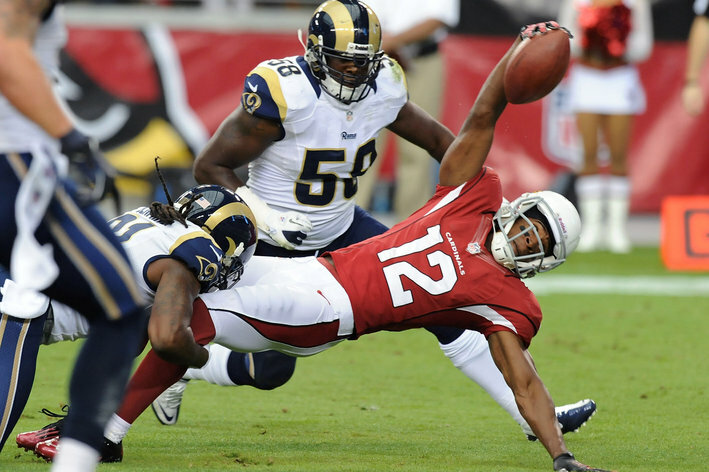 Andre Roberts-WR-Cardinals- Targeted 9 times by quarterback Carson Palmer, Roberts finished the game with 8 receptions. His 97 receiving yards were the most of any Cardinal receiver including Larry Fitzgerald. Although he didn’t score any touchdowns, they will come as long as Fitzgerald sees the kinds of coverage that usually follow the veteran receiver. The Cardinals take on the Lions in week 2 and we look for Roberts to have double-digits in fantasy points in that contest. Owned in just 22% of Yahoo! leagues, Roberts should be owned in all mixed leagues. 4. Brent Celek-TE-Eagles- The seven year veteran, all played on the Eagles, had a falling off last season (as did the entire team at large). However over the three year period from 2009-2011, Celek averaged around 750 receiving yards and just under 6 touchdowns each season, so we know how capable he can be. He already scored in week one on three targets ( 56 receiving yards), and, as Julius Thomas will be long gone, you could do worse than Celek who is owned in less than 10% of leagues. 5. 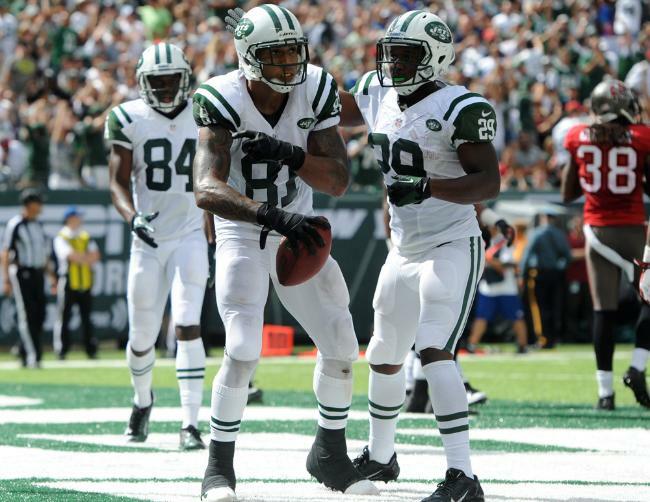 Kellen Winslow-TE-Jets- Talk about your veteran tight ends, Winslow is entering his eight full year in the NFL and if his week #1 performance is any indication of how much he is still in game shape, then he could be a very quiet little sleeper for some of you owners in deeper leagues. Rookie quarterback Geno Smith showed how he needs to rely on a veteran like Winslow by rewarding him with the game’s 2nd most targets (8), most receiving yards (79), only receiver with a touchdown, and finally a very serviceable 11.3 YPR. Winslow who just turned 30 this summer, played for 3 years with Tampa Bay (’09-’11) and averaged just under 800 receiving yards per season and tallied 12 TD’s over that span. He could prove invaluable to Smith as the season progresses and while he still is getting familiar with his new system. I have already picked up both Winslow and Thomas, should I drop Sudfeld, or hold on a few more weeks to see if he develops? Help me, Help me please! 1. Is Sudfeld your only other TE? 2. What other (if any) serviceable TE’s are on waivers? 3. How many teams are in your league? He was my only TE but picked up Julius Thomas and Kellen Winslow. It is a 12 team league PPR. Is he worth keeping or dropping and going with Thomas and Winslow. also in our waivers are Pettigrew, Ed Dickson, Coby Fenner, Dwayne Allen. Thomas is a definite keep and start this week! Winslow should remain your backup as he has the most upside as Geno Smith’s go to guy. Sudfeld is the weakest link and expendable. The TEs remaining should stay on the waiver wire. Good luck and email me if you need any further advice.. I started Sud last wek, dropped him, and now have Thomas as my starter. I likw Thomas, but TE is so deep, you could go either way and come away with somethig. Apologies on the interrupt of all things sports. But today, I got to thinking on the friends I’ve made here. Your name came up. Here’s to you. That was really thoughtful of you Cayman. Yeah, it’s been a while since we’ve been “blog-buddies” and I’ve enjoyed the articles you’ve put out as well as the banter. I’m probably the only sports blogger out there that appreciates your humor as well as the outstanding writing. Gotta go now…gotta ride the peace-train….